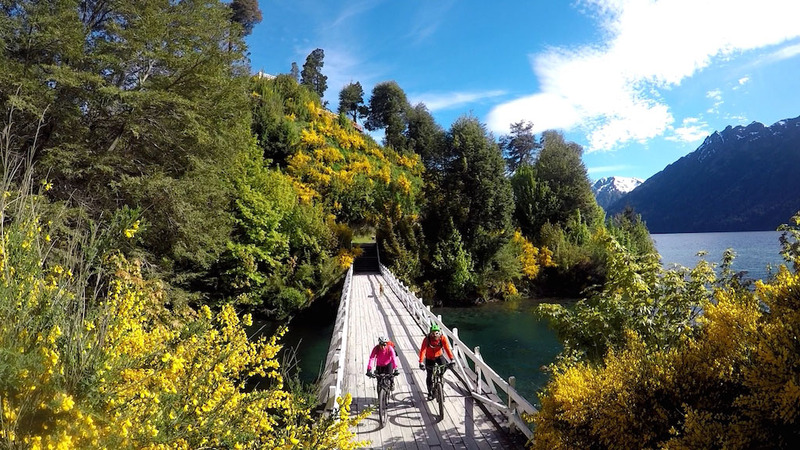 An adventure mountain bike trip that goes right into the heart of Patagonia. Connecting the Pacific and Atlantic ocean, crossing the Andes and riding through Patagonia along the Somuncurá plateau. We follow off the beaten roads and single track paths while discovering fantastic views and also meeting the local population. We start our mountain bike trip biking by the Pacific ocean coast line. We cross on boat to Caleta Puelche, we continue mountain biking on a gravel road for 45 km, in the Reloncavi bay (Pacific ocean). 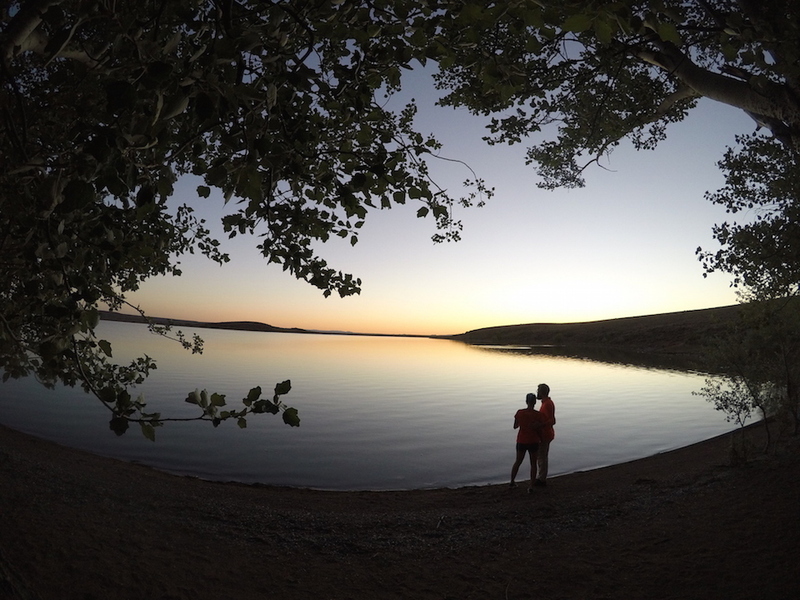 We stop at a cabins lodge at the village of Puelo. We go mountain biking to the end of the Reloncavi bay with occasional cliffs over the Pacific ocean with wonderful views. On this section the ocean looks just like a lake with tall leafy forest, big ferns and big leaf plants called ‘nalcas’. 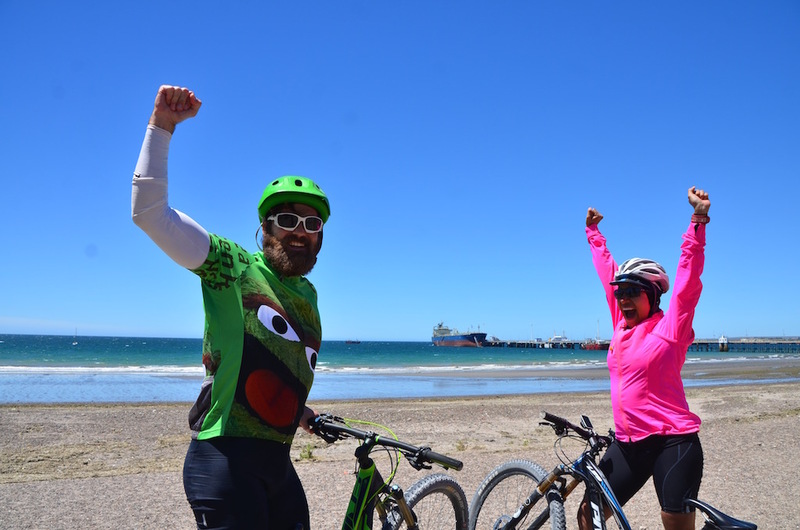 We bike along a typical South Chilean town called Cochamo. 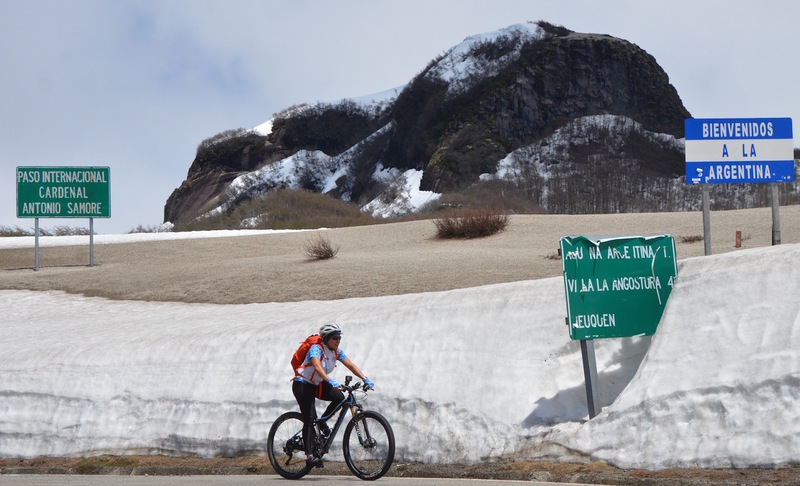 After 55 km of biking we reach Cardenal Samore Puyehue Pass ( at 1350m) from here we have a 20 km long downhill section. 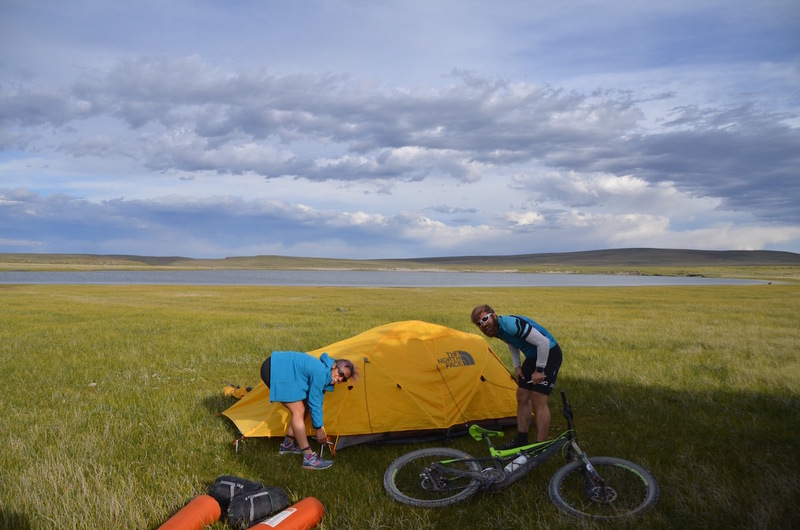 We ride with our mountain bikes past lakes Espejo and Correntoso. Daily biking ride: 95 km, on paved road. Leisure day. In the morning you may visit the unique Arrayanes national park 24 km (12km + 12 km) through single tracks to Peninsula Quetrihue. 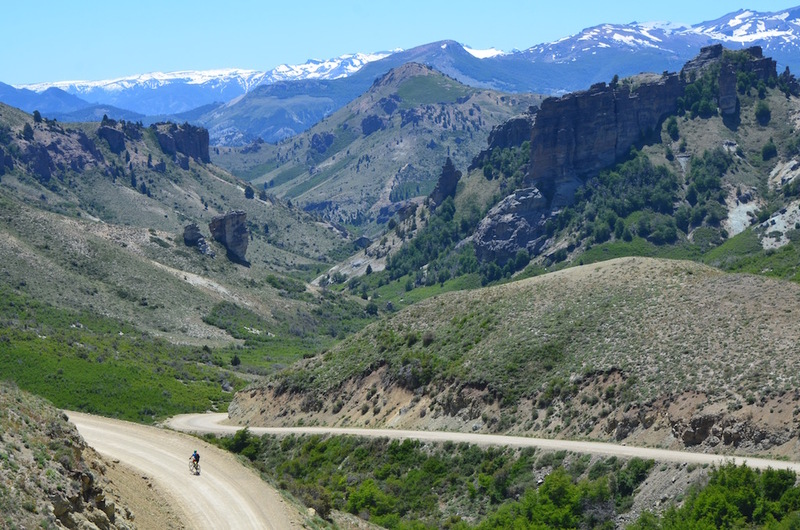 These biking trails are considered a bit tougher or more technical for mountain biking. (up and downhill sections with branches and roots on the way, not so smooth single tracks but wonderful for a bit of adventure on your mountain bike). At the end of the trail you get to the unique Arrayan forest (trees with smooth, cold bark of a reddish brown color with white spots). 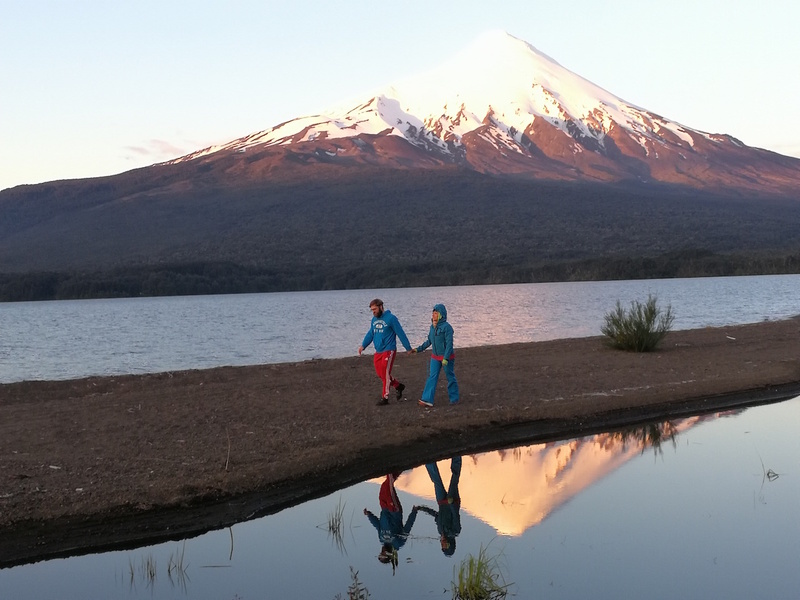 In the afternoon, if you prefer you, may return on a boat to Villa La Angostura. Daily biking ride: on single track trails 24 km (optional). Lodging: hosteria – inn (same as night before). 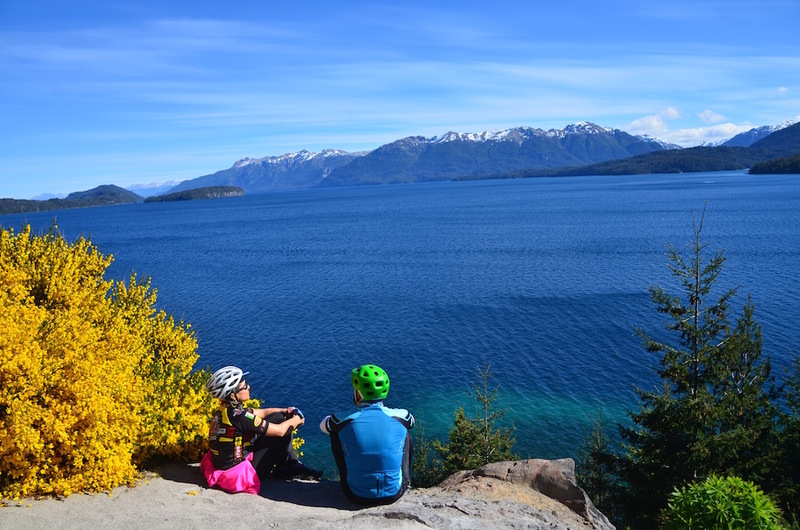 We mountain bike on the so called seven lakes road (Camino de los Siete Lagos) which goes through the Nahuel Huapí National Park and Lanin National Park. The road is uneven with downhill and uphill sections along the lakes coasts line surrounded by thick leafy forests. Daily biking ride: 110 km (60 km gravel road). 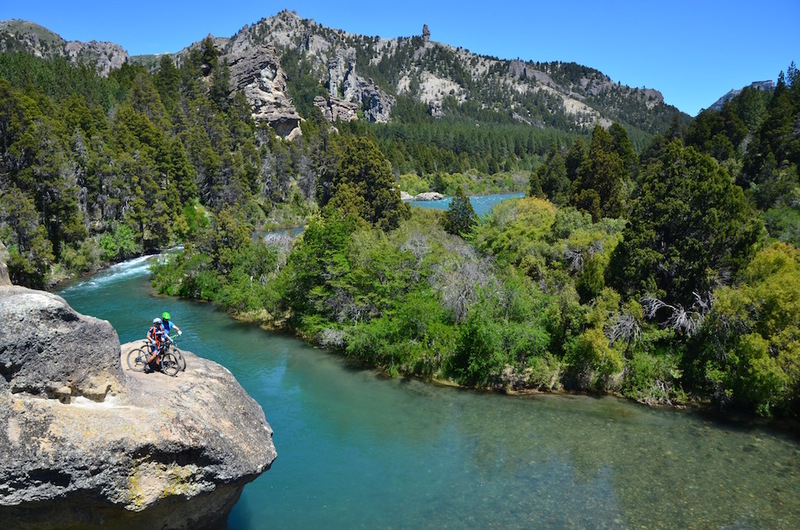 Mountain biking along Meliquina lake coast line we bike uphill to the Córdoba Pass, then we descent to a beautiful amphitheater where flow three rivers in the same pike. 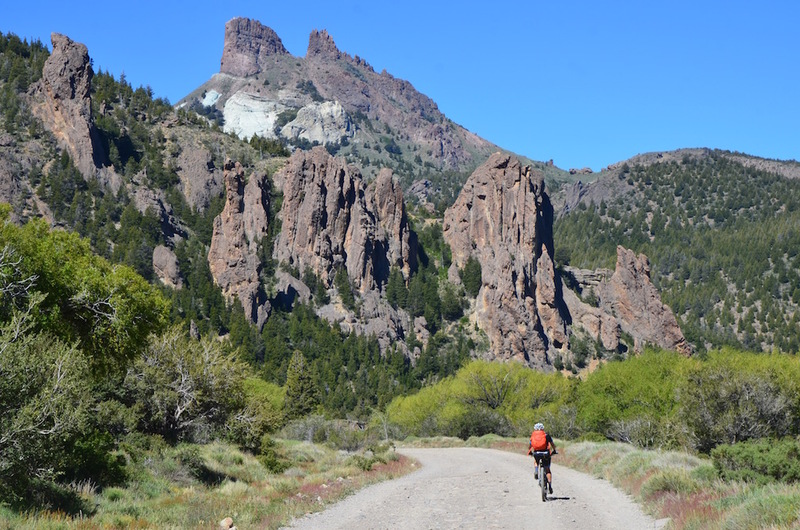 We then continue mountain biking the last 25 km on paved road along the Limay river enjoying great views of the curious rock formations of this landscape. Daily biking ride: 100 km (75 km gravel road, 25 km paved road). Daily biking ride: 85 km gravel and dirt road. The wind on our backs will help to finish the day. 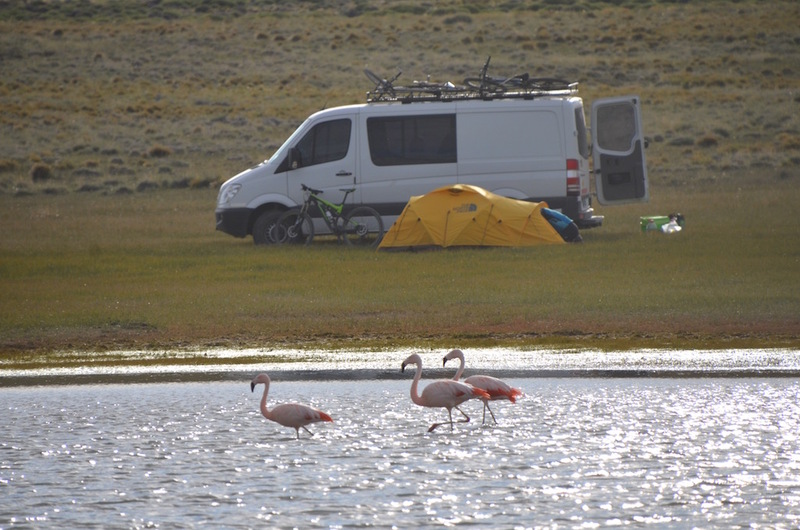 We ride through rural areas where we can see local native fauna species such as Patagonian rabbits (maras), foxes and birds. This will be a long mountain biking day with a 1300 high pass and several uphills and downhills, the last one 40 km long. Good quality of gravel road. We pass along Maquinchao turning to route number 5. This is the only flat section of the whole mountain biking trip. Daily biking ride: 95 km gravel road. dust road in good condition past El Cain and detour south. Here is where we enter the mysterious Somuncura plateau. The landscape changes, the colors vary, there are some oasis and lagoons on the desert land. 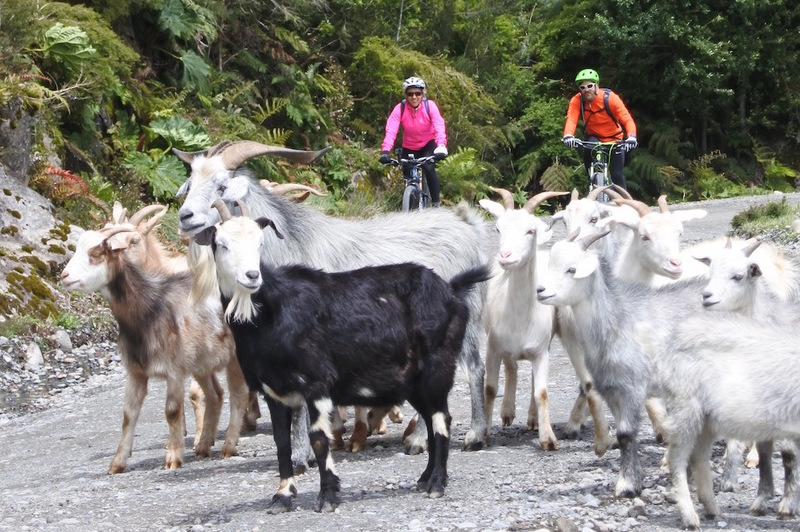 The last section of the mountain biking day goes on a single track which lead us to the small Barril Niyeu school, where we will have the opportunity to experience the local people kindness and friendliness. We will eat a special barbecue (Patagonian lamb barbecue) we will have the chance to get a hot water shower and sleep on a comfortable mattress. This desertic section of the biking trip we pass along Telsen. We go on the van (support vehicle) for a part of this section. (good wind. The road has some hills).We arrive to the Atlantic ocean to Puerto Madryn. Leisure day. There is an option to go on a wildlife observation tour where you may see local fauna (ñandues – kind of ostrich, foxes, guanacos, sea lions, seals and whales) at Valdez Peninsula. Pacific ocean, Puerto Montt (Chile), Llanquihue lake, ascent to Osorno volcano, hot springs resort Aguas Calientes, crossing the Andes Puyehue pass (1.300mt), Peninsula Quetrihue (arrayanes forest), Villa La Angostura, Bariloche, Maquinchao, Somuncurá plateau, Telsen, Puerto Madryn Atlantic Ocean. Medium to high. Daily 90 Km rides of 5 hr.. Divided in two sections ( morning - afternoon) . Short stops for water and snacks have been taken into consideration every 2 or 3 hs. The average speed is approx.. 22 Km./h . The wind blows from the west and we can almost guarantee that it will not be a problem. Between 5 ºC and 25ºC (we recommend you to bring along a sleeping bag with “comfort bellow 0ºC”). The weather is usually dry but you may experience rainy days at the Andean region and Chile. No need for saddlebags unless you want to carry your own camera. minimum 8 people. Registration should be confirmed one month in advance otherwise a 15% will be added to the price.